Our PE Environmental exam review course is designed to help you prepare for the new Computer-Based Testing format. The course is divided into two sections: refresher classes and workshop sessions. Refresher classes offer comprehensive lectures. These lectures cover the topics that are on NCEES’ PE Environmental exam specifications. Workshop sessions give students the opportunity to work through PE Environmental practice problems. Live Online - Some students want a structured, scheduled class but don't want to travel to an onsite classroom– we get it. We created our Live Online course specifically for this reason. Our Live Online review courses offers live-interaction with instructors and classmates, but it allows you to attend from anywhere with internet access. Ondemand - Sign up today, begin studying today! When you register for this flexible format, you will receive access to course materials immediately. Ondemand is the perfect format for students who want to begin studying as soon as possible. Want to learn more about our learning formats? Check out our Compare Plans table to see what features are included in each learning format. We also offer bundling options at a discounted rate if you would like to register for both learning formats. What do our students say about our PE Environmental exam review course? "The very knowledgeable and engaging staff provided great lectures and problems very similar to what you will see on the very broad Environmental PE exam. This was my second time taking the exam and wish I just took this course earlier instead of studying on my own. Do yourself a favor and take a prep course and don't waste your time studying countless hours on your own!" "The material provided for the Environmental PE exam fully prepared me for test day. The only other resource I utilized during the test was an NCEES practice exam, and I passed on my first attempt. I recommend taking the Ondemand class in addition to the Live Online class, as it allowed me to get back in the groove of studying after being out of school for over four years." The PE Environmental exam, a Computer-Based exam, is 9 hours long and includes 80 questions. Exam participates may not bring outside reference material but can use an electronic version of the PE Environmental Reference Handbook by NCEES. According to NCEES, the national pass rate for the PE Environmental exam during the last examination session was 69%. School of PE’s students had a much higher pass rate that the national average. Water under an 18m head discharges freely into the atmosphere through a 25mm diameter orifice. The orifice is round-edged and has a coefficient of discharge of 0.98. 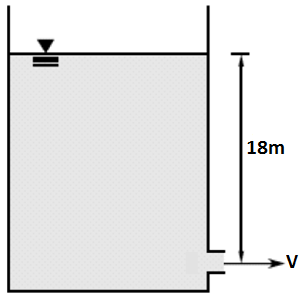 Determine the velocity of the discharge water.